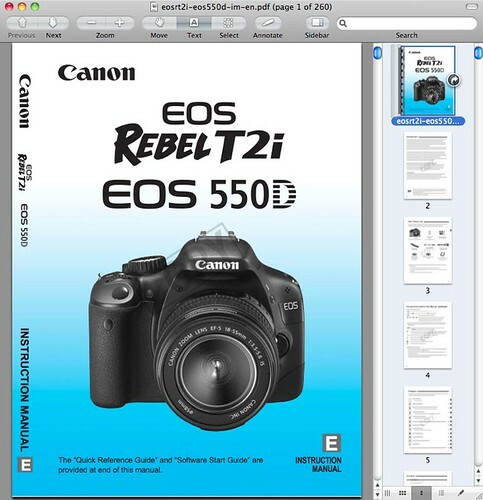 The English Language Canon T2i / 550D / Kiss X4 user manual / operating instructions (Canon calls it the “EOS Rebel T2i / EOS 550D Instruction Manual”) is now online and available for download at Canon.com (right-click and save the user guide to your hard drive). If the download link didn’t work for you, go to the Brochures & Manuals download section for the T2i / 550D / Kiss X4 on Canon USA and manually locate the file, titled, “EOS REBEL T2i / EOS 550D Instruction Manual eosrt2i-eos550d-im-en.pdf”. Unlike with Nikon, Canon allows you to freely print the T2i / 550D / Kiss X4 owner’s handbook without building in any password protection into the PDF. There is a watermark displayed on each page though. However, re-saving or copying portions of the manual does require a password. The file size of 260-page Canon T2i / 550D Adobe Acrobat PDF document is 5.7 MB (megabytes). The guide discusses the features of the T2i / 550D / Kiss X4 and how to use the camera. 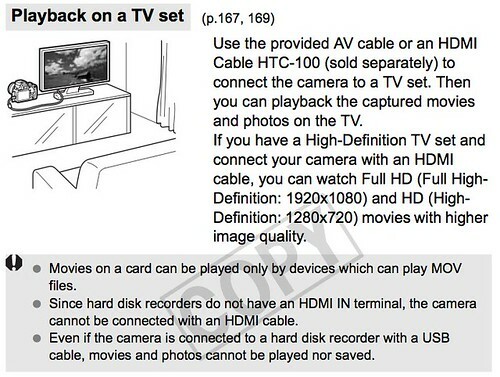 The manual specifies the use of the Canon HTC-100 Mini-HDMI Cable option for viewing still photos and movies streamed from the camera. Canon also makes it clear that only media player devices which support MOV files can play movies on the memory card. Just like the previous generation Canon T1i / 500D / Kiss X3, the T2i / 550D / Kiss X4 features an IR (infrared) remote control sensor on the front of the body. This allows you to use the Canon Wireless Remote Control RC1 or Canon RC-5 Wireless Remote Controller infrared remote control units to trip the camera’s shutter. You can also shoot BULB exposures, see Wireless infrared remote triggers for the Canon XSi / 450D for details, and also for the differences between the RC-1 and RC-5 remote control units. Another option is to shoot with a Canon Remote Switch RS60-E3 which functions as a shutter release cable that’s also suitable for long / BULB exposures. 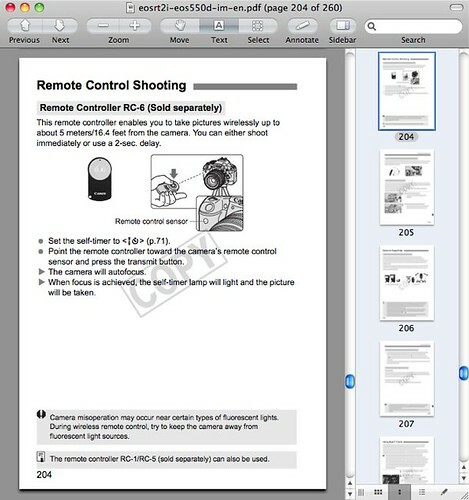 Unlike with the higher-end Canon DSLR models such as the Canon 7D, Canon does not make a remote timer switch such as the Canon TC80N3 Timer Remote Control for time-lapse / interval-timer shooting (see the Canon 5D Mark II manual post for a screenshot of the relevant page). Therefore, you’d need to settle with third-party options, for instance, the Phottix Nikos, if you want such features — see Canon T2i / 550D / Kiss X4 Remote Shutter Release Trigger Options for more details.